I just can’t seem to find my creative mojo at the moment so I kept things pretty simple with the lunches this week. We had a lot of old favorites, but the boys tried a few new things too. Check it out! 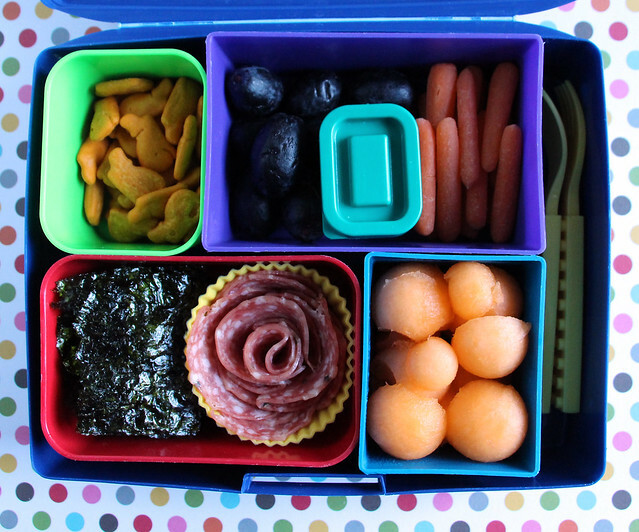 Wyatt started out the week with this Laptop Lunches bento box packed with cheesy whale crackers, black grapes, black bean dip, carrots, cantaloupe balls, a salami rose in a silicone baking cups , and seaweed sheets. 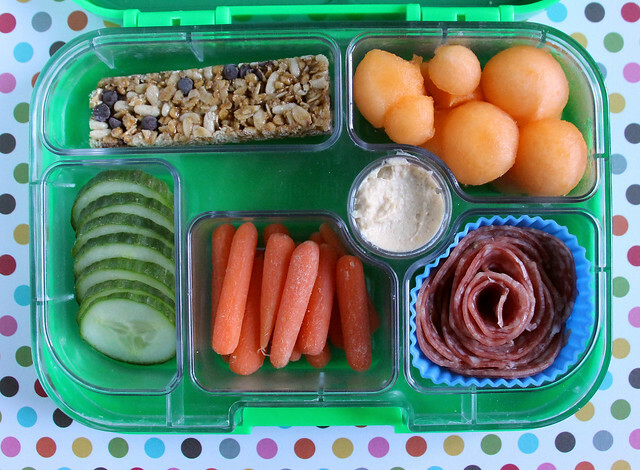 Augie had a chocolate chip granola bar, melon balls, salami, hummus, carrots, and cucumber slices. This was packed in a Yumbox. Usually he has a few things left in his lunch box after school which he eats for a snack at home, but on this day Augie ate everything! 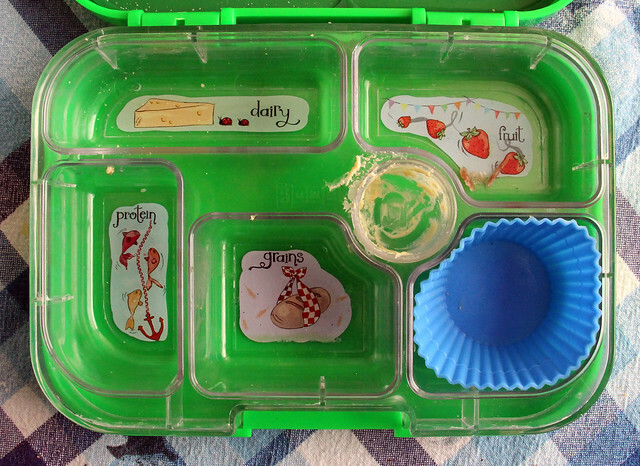 This lunch is evidence that even if your morning goes horribly wrong, you can throw a bento together in under 5 minutes. I woke up late Tuesday and the kids were bickering from moment #1 so I was in a foul mood. Then, as I was rushing around the kitchen helping the boys get their breakfasts together, I knocked over a large tumbler of sugary milky tea and spent 20 minutes (20 MINUTES!) cleaning it up off pretty much our entire kitchen floor (it truly was a spectacular mess) while the kids abandoned all of their morning jobs to watch me and point to all the spots I was missing as I mopped. 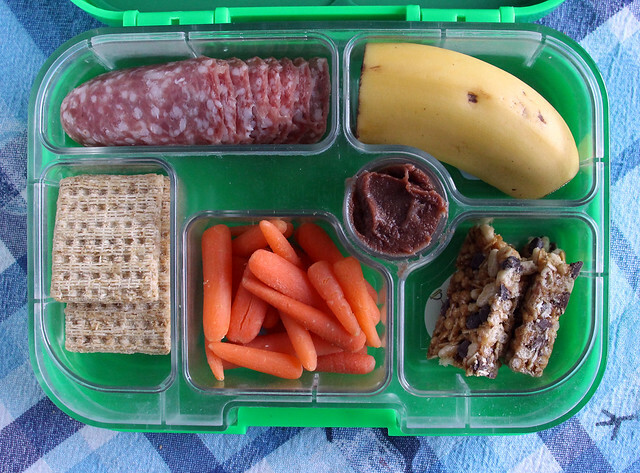 Yet somehow I still managed to get this Yumbox lunch together for Wyatt: salami, half a banana, granola bar, carrots, bean dip and a few Triscuits. 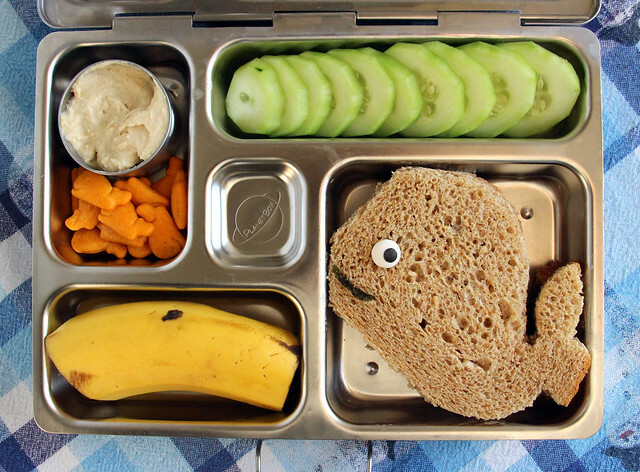 Once I had everything cleaned up and I got Wyatt off to school, I had a little extra time to pack this PlanetBox lunch for Augie: hummus, whale crackers, cucumbers wheels, a nervous looking whale sandwich and a half a banana. I picked up the whale cutter from the clearance rack at Michael’s ages ago and though it seemed just right for cutting sandwiches at the time, it is actually a bit large for a slice of bread so this is the first time I’ve used it. At first I only had an icing eye on it for decoration, but when Augie looked at it, he said it definitely needed a mouth, so I cut one from a little seaweed sheet. We both agreed he was much cuter that way. 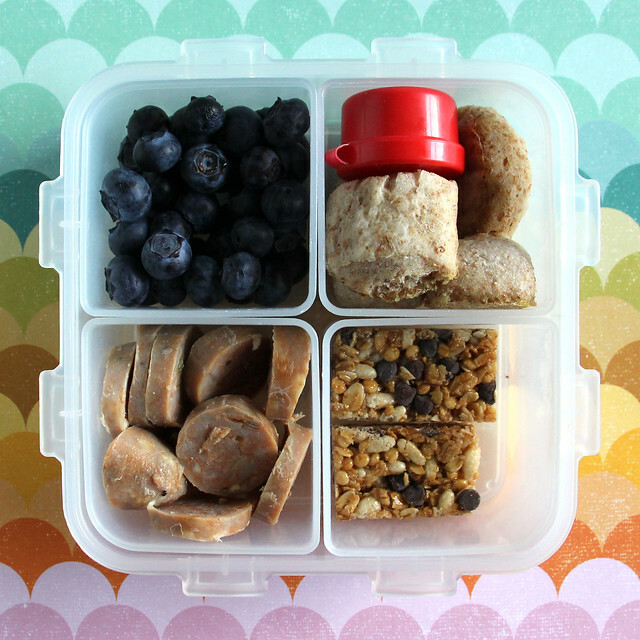 On Wednesday, Wyatt took his lunch in our Lock and Lock lunch box: blueberries, whole wheat pretzel bites, mustard for dipping, a granola bar and leftover mild chicken Italian sausage. The pretzel bites were a new recipe I tried and they were pretty good straight from the oven, but they were not very good the next day. I let Wyatt try one before I packed them and he told me he still wanted them, but he had only eaten one or two when I opened his lunch box after school. I’m going to have to look around for a new recipe, I think. Augie’s lunch was packed in our LunchBots Trio: sausage, grapes, blueberries in a star cup, Cheerios, cucumber slices, carrots and hummus in a little Lego box. 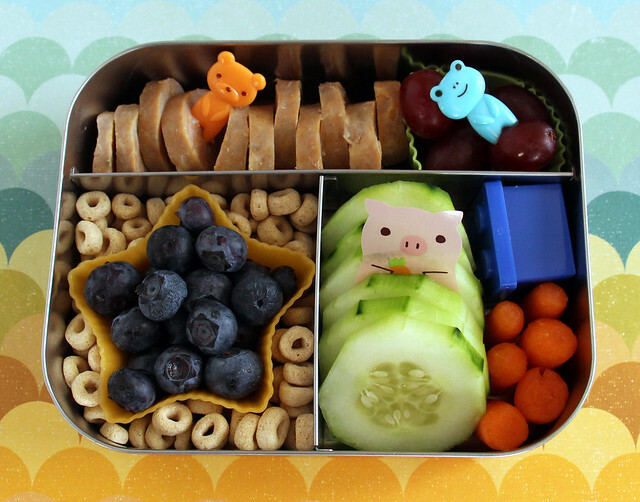 I also through in a couple of cute bear and frog picks for eating the sausages and a pig divider just for the cute factor. 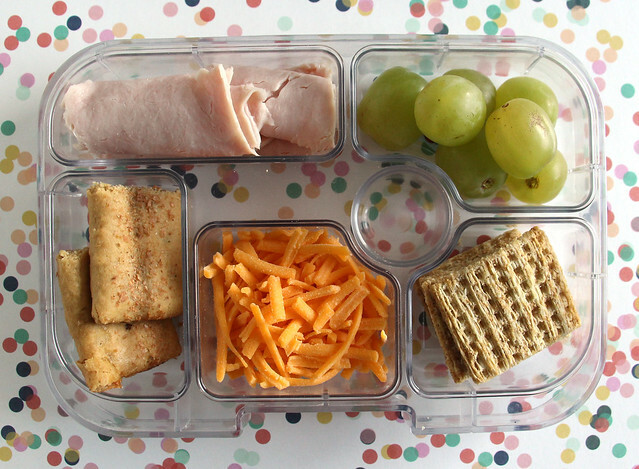 Thursday, Wyatt had yet another Yumbox lunch: deli turkey, grapes, Triscuits, grated cheddar and an apple flavored cereal bar. 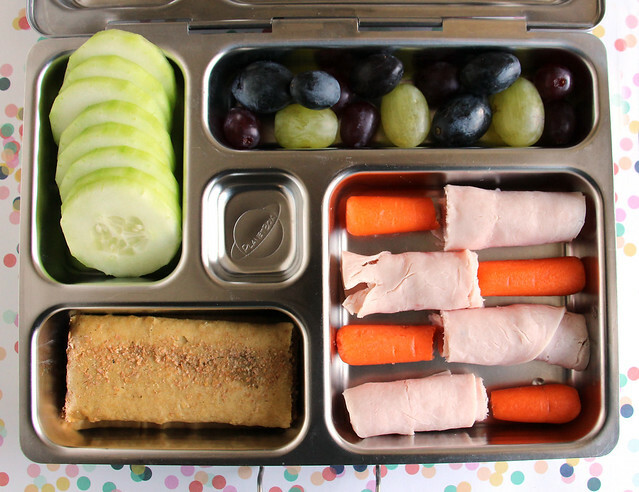 And Augie had a similar PlanetBox lunch: cukes, grapes, deli turkey, carrots and an apple cereal bar. Earlier this week, we got a box of goodies to sample from Van’s Natural Foods and I sent a couple of those in Augie’s Laptop Lunch box today. They sent two types of gluten free snacks — two flavors of multi-grain chips and another two flavors of PB&J Snack Bars. We are all really enjoying all of these treats and honestly I would never be able to tell they were gluten-free if I didn’t know. 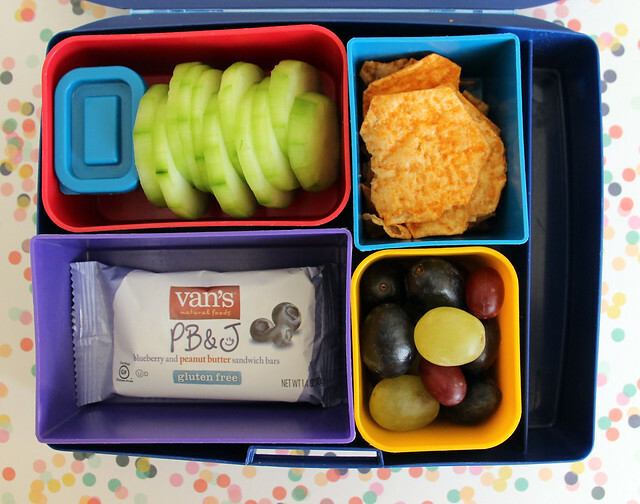 Today Augie had the bbq chips and the blueberry PB&J bar in his lunch, along with the omni-present cucumbers and hummus and a cup of grapes.